Back from Oerol! I will post some pictures of it later this week, it was great. I'm still in the traveling mood, so a travel-themed outside-inside post this time seems fitting. I'm not a big fan of camping (i'm more the cabin-type), although I've learned the how-to over the years. 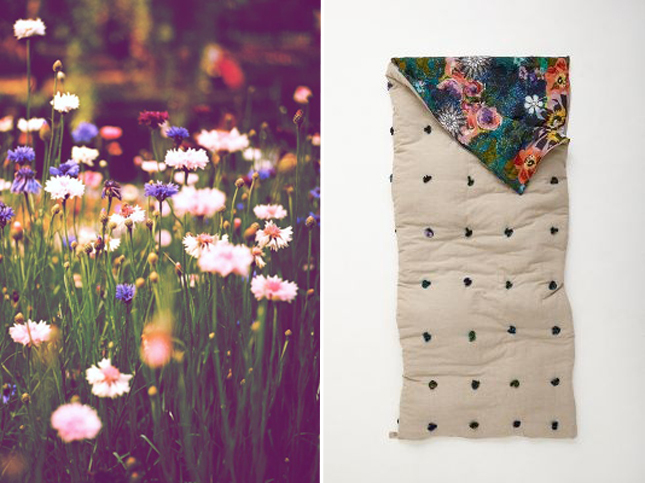 But what a gorgeous sleeping bag from Anthropologie is that. Would make camping so much more fun. I'm afraid that it is no longer for sale, but maybe it's inspiration for an upgrade of your own boring sleeping bag :).